Nigerian Dwarf goats are a great choice for any size homestead, especially those that are short on space. Nigerian goats are the perfect small scale dairy animal. Guest post from Leona at Cedar Green Farm. 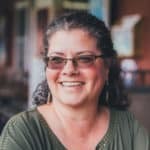 We have been homesteading for about five years now, and have learned a number of lessons through every day experience. One of them is that Nigerian Dwarf goats are the right choice of dairy animal for us. We live on just under two acres, part of which is forested and boggy. Our rainy climate and small property could not support a cow, but goats are a good option. They are light on their feet, they are great browsers, and they require much less space than a cow. We also don’t need the amount of milk a cow would produce. 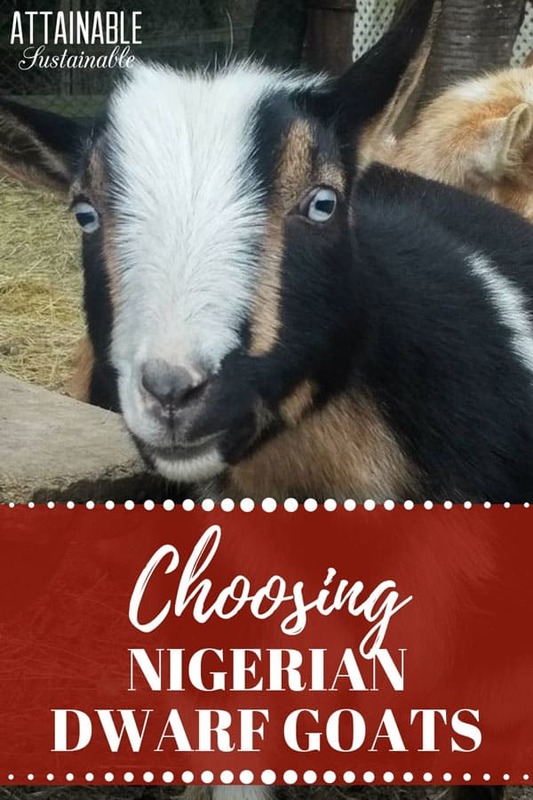 Nigerian goats seemed like a good option, and their small size made the introduction of animals larger than chickens a less intimidating experience for the city girl in me. Eventually we did try the Alpine breed, but we decided to stick with Nigerians for a number of reasons, one of them being that our children didn’t like the Alpine milk. 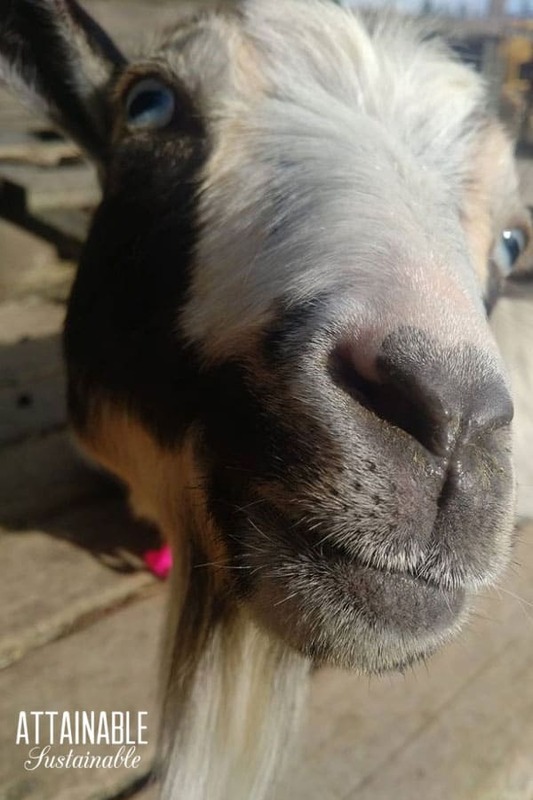 Here, I have outlined five good reasons a small-scale homesteader should choose a Nigerian Dwarf goat as a dairy animal. Because these goats are small, they tread lightly. They’re also more efficient eaters than other breeds of goats, producing more milk in relation to what they eat. A Nigerian buck weighs about 80 pounds, where the larger breeds which can weigh 200 pounds. Fencing doesn’t have to be quite as high or quite as strong in order to keep them in. Good fencing is still important though, since it not only keeps the goats in, but the predators out. 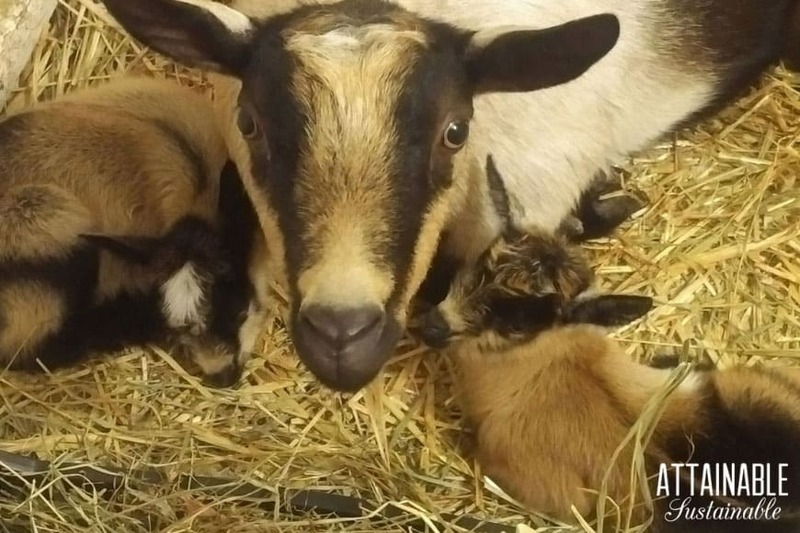 These dwarf goats regularly kid twins, triplets, and quads more often than other goat breeds. They rarely have difficulty kidding and they make excellent mothers. Our purebred, registered Nigerian Dwarf babies sell for about $400 each. 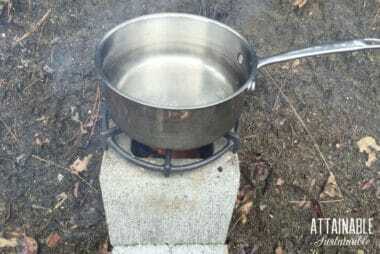 This allows for a continuous milk supply. Other types of goats only breed in the fall for spring births, which means a break in milk production for a few months. Nigerian Dwarf goats cycle year-round and have the capability of kidding year-round. We choose to have each goat kid once a year, in the spring and the fall to avoid cold winter kiddings. Trendy means that you won’t have trouble selling the babies, and at a decent price. A good Nigerian dwarf goat, after maxing out at about two quarts a day several weeks post-kidding, will produce on average one quart a day. Their milk is the sweetest (with no goaty flavor) and the richest, averaging about 8% milk fat. This allows us to make amazing yogurt, cheese, and ice cream! These small goats generally have a great disposition, the babies—about two to three pounds at birth—are absolutely the most adorable creatures you have ever seen, and you can carry the adults around if you have to. Need I say more? 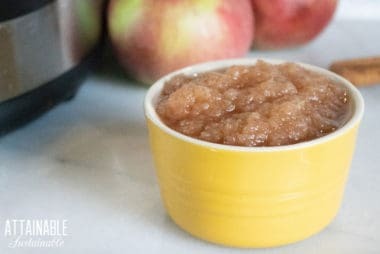 Leona blogs about homesteading, natural living, healthy recipes and DIY projects on her blog My Healthy Green Family. 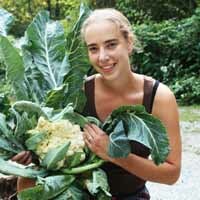 She lives on a small acreage with her husband and 3 young children on the coast of BC Canada. Homestead life is busy, with a large organic vegetable garden, fruit trees, chickens, goats, pigs, ducks, honey bees and a dog. You can see more of Leona and her goats at Cedar Green Farm. All photos courtesy of Leona. I’m thinking about getting a couple goats. We are short on cash, but maybe in the future. Do I need anything special for goats? A goat needs a companion since they are herd animals. It is important to get two or none at all. A good choice to start with would be two females, or a female and a wether. If you get a male and a female you will expect babies in the next 5-6 months at which time you will have to separate the male from the female until she can be bred again, at least 6 months after she has kidded. Then you will need a companion for the buck, so a good starting point is two females or a female and wether. Goats need proper shelter to live in, good quality hay, an area to range or browse if possible, and water and minerals at all times.If you start breeding you will need a separate place from other animals for the doe to kid and bond with her babies. Regular maintenance is required such as trimming hooves, watching for health issues, and taking preventative measures for lice, fleas etc. You need a good strong fence to keep goats in and predators out. THe more prepared you are before you buy the animals, the less trouble you will have. As with any new animal, take time to research LOTS before you jump in so that you are prepared when emergencies arise, and you understand what is involved in daily care. And enjoy! I have been looking for some Nigerian goat babies! I can’t find any in Manitoba, Canada. Where are you located? Do you know of a good way to find some? They really are such great, little animals! We loved having ours and they were a great size for the kids. With my carpal tunnel, though, I just couldn’t milk such tiny teats so we had to pass them on to other loving homesteaders. I still miss them! In our city they allow goats if you take a class, which I did and had my nieces join me. We have a doe and wether. Kronk our whether is best friends with my Pitt pup and even if he has the other goat he will yell at me until my pup gets put in the kennel too. We take them all for walks through town and to the river. We ofcourse live in the middle of the city and our Nigerian dwarfs are a great hit. We also have chickens, rabbits, ducks and do a garden every year along with our fruit trees. The neighborhood kids and all my nieces and nephews volunteer to help with the chores. Thanks for the info. I’m a cow person – but if I was going “goat” these would be pretty tempting! I have been helping at a local Nigerian farm… these goats are so laid back, and very lovable!! When I go to milk, I spend extra time with each goat for love. The milk is good.. They make all sorts of stuff.. including their own soaps and lotions with the milk..as they milk twice a day. The neighbor even gives some of the milk to his chickens, which they love. Our chickens? Not too crazy about it. Can you keep 2 Nigerians in a 4 foot high fenced yard? I am looking for neither dairy or meat. Is it right that they only produce milk if you breed them. Yes, they need to be bred in order to produce milk. I was wondering how often they have to be milked. I would love to raise goats for milk, but I have heard that they need milked every day. I am not sure that we are able to commit to that. And I don’t want to purchase them and not be able to take care of them appropriately. Thanks for the response! Daily, yes. Some milk once a day, others milk twice. That said, though, my neighbor always kept a kid with mom. IIRC, they’d separate them at night, milk in the morning, then allow the kid to nurse for the rest of the day. On days they *couldn’t milk, they wouldn’t separate. How disconnected are we that people don’t know you have to milk an animal at least once a day or that you have have to breed an animal for it to start producing milk. Unbelievable. Some of us were raised in the city. We were not exposed to the blessings of farm life. Don’t fault us for our ignorance. People here are taking the time and effort to learn a new way of life. This is not an easy thing when you wereraised in the concrete jungle. So true! Glad to have you here. I am so glad I found this post! We are getting ready to move onto our two acre Family Property and I have been completely on the fence about goats or cows. We have never had goats milk and hate goats cheese ( the soft stuff) but my husband is diabetic and has high cholesterol and I have done extensive research on the benefits ( health) of goats milk. So, I am excited though nervous about getting goats next spring! Thank so much- I am sure I will be a follower- and probably more like a haunter. PS My web page isn’t quite yet up so what you see if you follow my web address is not a good reflection of my blog. Enjoyed your info on goats. We are just getting started with our home stead. We have 8.6 acres how many goats can we have on 8 acres. We are way out with lots of brush. HI Leona! I am trying to put together the research, since we just put in an offer on a small farm and have NO experience. 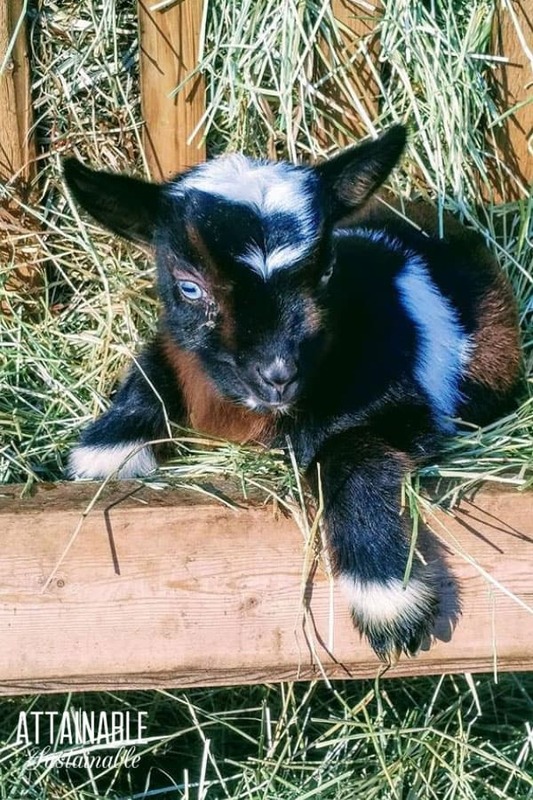 I am really excited about the idea of having Nigerian Dwarf goats but I am wondering about the selling process once the kidding (I think that is the right term) are weened and ready to leave their mom. How hard is it to sell them and where do you do that? Are there certain sites or organizations? When I search, I mainly find the large breeding farms. I just want to be ready for that process as well and know the steps. Thank you for any and all help! I bought 2 little Nigerian Dwarf goats about a month ago. They are 5 months old. Brother and sister. The male has been fixed. I had never had goats before. They are so cute and loveable. I let them out of their fenced in yard, each day and take them for a walk around my farm. I don’t use a collar or a leash. I walk along and they just follow me, They stop and nibble on a few leaves or plants. I sometimes walk them around for about an hour. Then I go back to their fenced in pen and open the gate and they go right back in. I have had no problems with them as of yet. I am new to this, so I am reading and learning all I can about these little goats. Someday if I want to breed my little girl goat, I will have to find a male goat to do the breeding. But for now, I am very happy with my 2 goats named Billy and Bella. I am a 79 year old widow living alone and these 2 goats keep me company. I also have chickens, 2 cats and a tiny dog. I just got my goats and i love them. Encouraging. I think fencing first. Can goats and sheep graze together? I have a fenced in backyard with a doggy door, also two Cavalier King Charles Spaniel, could I put dwarf Nigerian goats in the fence with them? Also, can they be house trained? Hoping that Leona will chime in!